Leary was a Harvard University psychology professor who founded the Harvard Psychedelic Drug Research Program and administered psilocybin (“magic mushrooms”) to graduate students. Dismissed from Harvard in 1963, he moved into a mansion in Millbrook, New York, where he presided over a small community of experimenters with the psychedelic drug LSD. 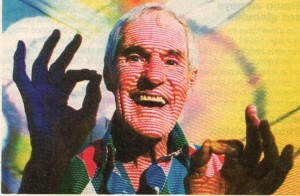 He claimed that the drug enabled a spiritual “mindexpanding” state superior to anything contemporary conventional American society had to offer, and he advised his large lecture audiences to “turn on, tune in, and drop out.” The phrase became a slogan of the 1960s counterculture movement.